Do you have an existing list of gift certificates or looking to generate promotional certificates for your customers? We'll share with you the steps to get your data ready and import into PeopleVine. If you don't supply a certificate number, we'll auto-generate one for you. The platform will also default the type of certificate to a gift certificate. 3. Attach the CSV file with at least the current value and email address. 4. 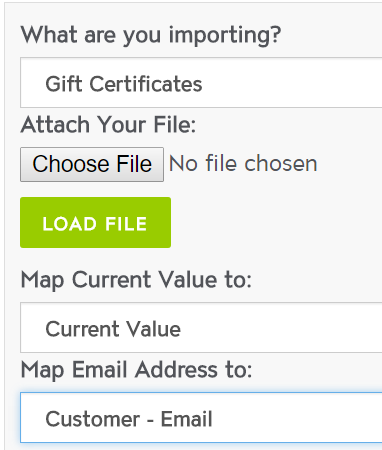 Once uploaded, it will then prompt you to map the fields to the available fields for the import. The default values are highlighted if you don't supply anything. The expires on will default to your gift card settings. If a serial number already exists, we will update the values.